Europe as a social project, based on justice and solidarity – that is the vision our guests of this Video- Session unfold after an hour of inspiring discussion. They share the same dream that all citizen of Europe should be at a same level – so also young people in Eastern European countries don’t feel as „second hand Europeans“. „Europe, a wish concert. Visions for a Europe of the Future“ was the title of first video conference the GSI has organized on Tuesday, March 12, to discuss the upcoming European elections. Ulrike Guérot, founder and director of the European Democracy Lab, Germany, Vincent Engel, Professor of Literature at the CU Louvain, Belgium, and Stamen Balchev, student of political sciences from Bulgaria, exchanged their views on the current situation in Europe and why Europe needs visions and „un myth rassembleur“ in future. Moderated by Sabria David, Slow Media Institute, this was the kick-off for further cross-border video conferences that bring together experts from different countries to allow a transnational discourse on European topics. 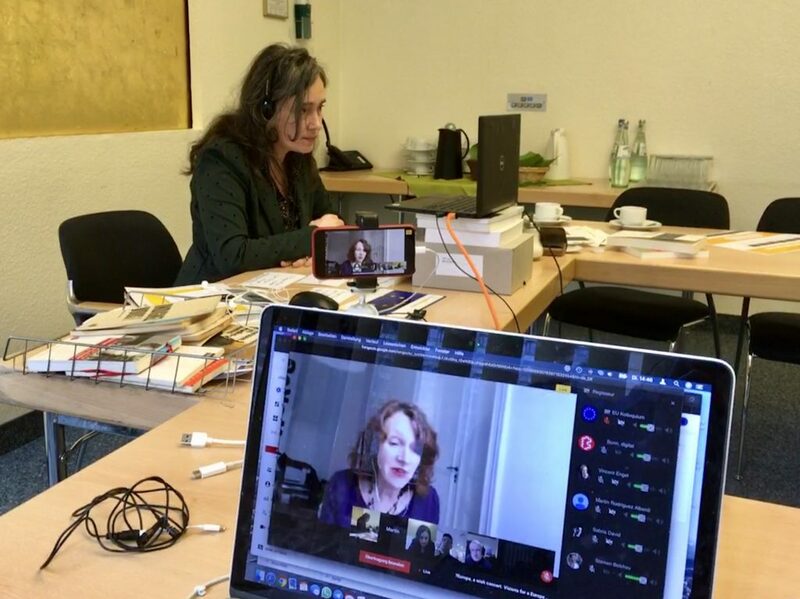 These video conferences are one column of the Colloquium „European Societies in the Digital Age“, which also comprises a yearly convention in Bonn and Expert Round Tables in EU member states.